Up for grabs is the book, Everything You Need to Know to Evaluate a Whole Language Program: Forms, Strategies, Techniques, & More by Judith Cochran. You MUST leave an additional comment for each additional entry!!!! Giveaway ends on Wednesday, September 9th. I will use Random.com to select a winner. The winner will be notified (be sure there is some way for me to contact you...through your blog or leave your email) and will have two days to respond or another winner will be chosen. Once the winner has claimed the book, I will announce it here. For more homeschool curriculum and books (free and for sale), be sure to check out the Not Back-to-School Blog Hop by clicking the button above. for extra math or reading comprehension. We also have added your button to our blog a while back. Yay, you have such great information. Bless you friend. I have your buttin on my blog! I love to use Starfall! My daughter learned to read very quickly with their program. Thanks! 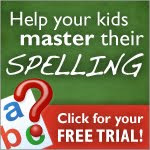 We are new to homeschooling this year, but have used SpellingCity.com in the past and are already using it this year. You type in your kids spelling list, save it, then they can use it to learn the words by practicing them, playing games with them, and testing. My son's spelling scores got much better after starting it last year.